Yes, June nights are so pretty with all the fireflies about! Back in my town, I made sure to talk to Tortimer at the pier before the night was over (I almost forgot! ), who was there to tell me that the island would become open to visitors tomorrow. Aww, there was something that touched me about hearing this from the long-standing former mayor of Animal Crossing. He hasn’t changed a bit. -_- Though it’s good that he’s back to driving a boat instead of taxis or buses. My Birdwing won the Bug-Off, but I missed the ceremony, so I don’t get a trophy. >_< I'm used to AC:WW, where you're mailed a trophy if you win. Ugh, I need to stop making assumptions and carrying over habits from Wild World! Edit: Actually, I did receive a gold trophy in the mail today! So I’m glad I didn’t miss out on that. I’ll try not to miss the ceremony in the future, though; my neighbors seemed disappointed that it was cancelled. I’m jealous of Hylia for having a deer neighbor, and jealous of Diana for having such a gorgeous house! I love that it’s nestled between the sea, cliff, and waterfall! The area feels private, and yet has plenty of room for gardening. I had to go sooner than I thought because something came up, I’m sorry about that! But thanks for letting me visit, and I’d love to WiFi again sometime. In the evening, I went back to the island to fill up my take-home box with valuable catches, one of them a whale shark! 😮 I also caught a saw shark, a giant trevally, a hermit crab, and of course lots of palm tree beetles. I brought back some flowers from the island as well. It sort of feels like cheating to do that, but hey, they allow you to both pick up flowers during the tours (I recommend the butterfly-catching tour) and put the flowers in the take-home box. My dad doesn’t have the island yet, so I let him come over to mine. We did tours until he had enough medals to buy his own wet suit. And we didn’t leave until his take-home box was filled with valuable/rare bugs and fish. He’s not good at catching bugs on trees, so I would stand nearby and tell him when he was lined up correctly and close enough to swing. 😛 It worked pretty well! 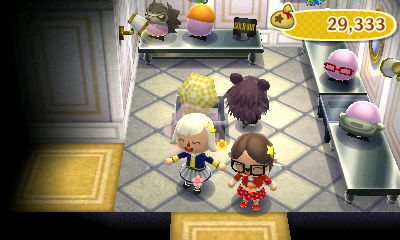 Posted on June 15, 2013 by Amy •	This entry was posted in AC:NL, AC:NL WiFi, Citalune and tagged Animal Crossing. Bookmark the permalink. Hey! My gates are open right now – and it’s 8:05! (My time) You coming over? Hey! I just tried to, but after waiting for the train for a good few minutes, I got Resetti (WiFi crashed, I guess). I’ll try again now. Aww, I was looking forward to it as well. But that’s okay, I hope it’ll work next weekend (or whenever you want to try again, just let me know). Maybe you could try doing a connection test in your “System Settings” to see if it works there. The strange thing is, everything but my New Leaf connectivity is working. Browser – check. Test – check. It’s so frustrating that I might actually end up grinding my teeth! Yeah, that’s weird, so maybe it’s possible the error isn’t your fault? As an example, I was trying to visit someone else today, and I got an error code message for the first time. (I didn’t get an error message when I was trying to go to your town, Resetti would pop up as I was trying to board the train.) But this same person (Liam) was later able to visit my town just fine, so it’s clear both our internet connections are working. It’s a gorgeous room, I love the mix of regal and mermaid furniture with the columns, harp, and jacuzzi. 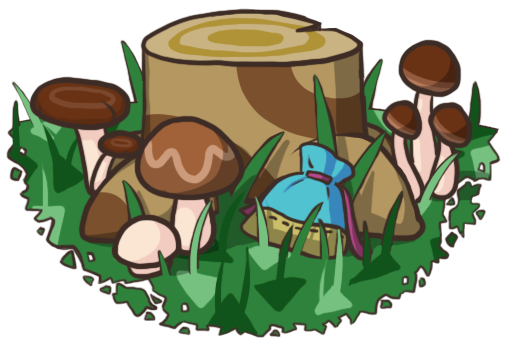 I’m probably jealous of most of the animals’ houses right now, a lot of them are so beautifully designed! I’m not happy at all with my rooms, I don’t even like to go inside my house because of it. Ooh, I think I’m jealous of Diana’s house too! I love the pink lighting and that jacuzzi thing. Yeah, I’d love to have a lavish room like that! I look forward to when I can start to decorate my rooms properly, right now they’re just a random hodge-podge of stuff I’ve managed to get so far. Oh yeah, it’s possible in every town, I think! Look for where your beach ends, and there should be a little strip of just ocean. The WiFi session that I had with you earlier today was a lot of fun!!! 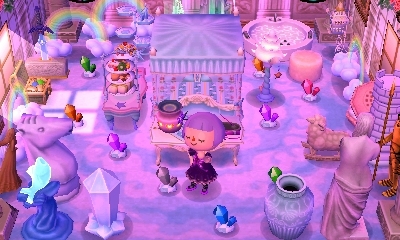 You have so many things and your town is already looking AMAZING. I need to learn how to fish -.- I have caught 1/27 finned fish that I attempted to catch. I made a new account. Idk what my cousin did to my old blog and account. I dont really care. And this is Ck. And oh my! You can jump off a cliff!!!! Everything looks gorgeous and super fun!! Yeah, a bit sad that I missed it, and my neighbors were disappointed too, aww. I’m sure there might be a few more this summer, though! I hope I can get more out of the next Bug-Off by beating the record multiple times and getting furniture each time. 😀 Congratulations on your win, and you would’ve beat me too! 😛 My Birdwing butterfly wasn’t very good (in size and luster), but I guess it was still good enough to win against my neighbors. I don’t do any diving unless I have a table to play on, where I can put the 3DS down and just put all my effort into mashing the A button. I bet I look pretty crazy if anyone sees me. Same to you: If you have any items you really want I’ll keep an eye out for them. I’m not really after any of the island items so I need a way to spend my medals!